Supported Languages: English, Russian, German, Spanish, French, Portuguese. 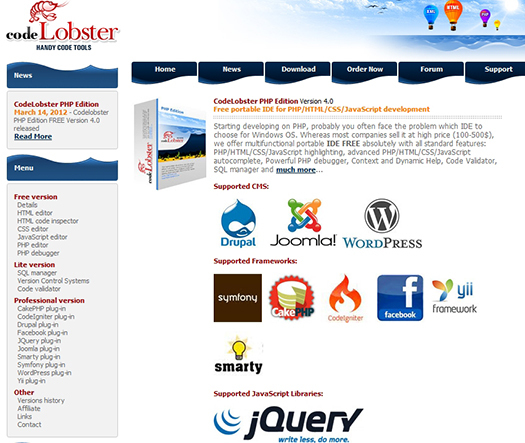 Latest Release: Codelobster PHP Edition FREE Version 4.0 – March 14, 2012. For creating Websites you need a good, easy to use editor. There are many paid products for this purpose, but it is good to select a free, very functional and at the same time simple to use editor – Codelobster PHP Edition. HTML/CSS inspector like Firebug, which easily allows to correlate the selected elements on a page with code and proper style. Context help on all supported languages. By pressing F1 key the page with detailed description for the current tag, attribute or function will be opened. SQL manager allows to produce all necessary actions with a database – add, delete, edit a structure and records in tables, export data and execute SQL queries. Highlighting and auto-completion also works for SQL files. FTP support that allows you to work directly with a remote server and do all necessary changes with files, same as an FTP client. Portable option that allows you to use the editor without the preliminary installation. Other useful utilities: such as pair highlighting, block selection, collapsing, tool tips, viewing of structure of files and projects, preview in a browser, bookmarks, and other standard functionalities of code editors. PHP frameworks: CakePHP, CodeIgniter, Symfony, Yii. WordPress blogging and CMS engine. You can find a complete description for all features on the Feature detail page and for the HTML editor by taking the Features tour. I believe that CodeLobster IDE is definitely worth your time to try it out, you have nothing to lose, and if you like it, you can upgrade to add the plugin support for different CMS and frameworks. If you have something to add, or you like to share your experience with CodeLobster, please share it in the comments section. Your opinion matters, unless it is a Spam. For the sake of transparency, this post is a PAID review. If you found this review useful, feel free to contact me for your product review or feel free to donate. Thanks! 60 queries in 0.273 seconds.